Blagovest Bells What did St. Innocent know, that we don't? What did St. Innocent know, that we dont? Did you know that when St. Innocent Veniaminov America's first Orthodox bishop (1840-1868) traveled Alaska, he had with him a priest, a deacon, a subdeacon, a reader and a bell ringer? He knew that, as "singing icons", bells establish the acoustic space of an Orthodox temple just as painted icons and hymnography define its visual and noetic space. Of course it probably never occurred to him, but he could have served liturgy without icons or even music ...but bells? Hard to imagine, isnt it? Unlike St. Innocent, weve always had to do without. Until now, that is. Now you can beautify Gods holy temple with the very bells every Orthodox faithful dreams of! Bells that St. Innocent and his ringer would be delighted to play. 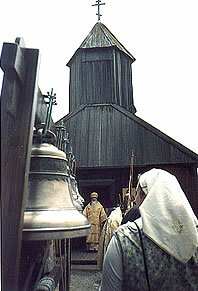 Yes, real Russian bells can ring in your parish the "singing icons" of traditional Orthodoxy. Almost 40 North American parishes have them already! We import only from Russia's best foundries. From the top award winners at All-Russian bell festivals. Names like Pyatkov and Vera. 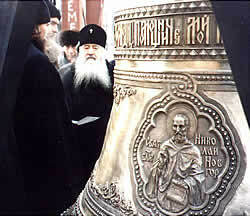 His Eminence, Juvenaly, Metropolitan of Moscow, inspecting a bell cast by Litex at a recent exhibition sponsored by AKIR. Bells that win awards like "Best Sound", "Best Appearance", and "Best All-Around Excellence" consistently, year after year. But magnificent bells are not all! As members of the Campanological Arts Association of Russia (AKIR), with patriarchal blessing and governmental endorsement the foremost bell testing, certification, and training body of the entire Orthodox world we can provide all the advice you need to choose a perfect set, set up your zvonnitsa (large or small), and train your ringers. We know youre interested. Think of it traditional Orthodox bells! Priced so low that even tiny parishes can take delivery in about six months. Bells with your own icons and inscriptions. Pure bronze, pure sound, awesome appearance! Joyous news? We think you'll agree. Check out our websiteyou'll find pictures, descriptions, technical articles, liturgical matters, history, theology, metallurgy and lots of samples of Russian bell-ringing. This tradition is nothing like any other, and it is humbling to realize the role we've been blessed to play in introducing it to North America. It's one thing to bless water. It's quite another to bless water with 100 tons of bronze singing in the air over your head about the condescension of the Son of God and the descent of the Holy Spirit! Let us know your thoughts! Get in touch about our video offer! And please dont hesitate to contact us! Rejoice! Imitator of the Apostles, and their Successor. Rejoice! Evangelizer of the Arctic peoples. Rejoice! Scholar and teacher of the Aleuts. Rejoice! Illuminator of the Eskimos. Rejoice! Humble genius whose footsteps were guided by the Lord. Rejoice! 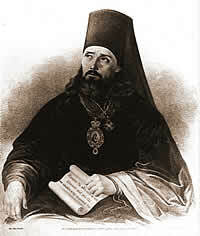 Visionary architect of the Orthodox Church in America. Rejoice! O holy Father Innocent, Equal to the Apostles and Enlightener of North America!